It's no secret that billionaire investor Warren Buffett has one of the best investing track records in history. From starting a handful of investment partnerships that were early versions of a modern day hybrid hedge fund and private equity fund to building an old textile mill into one of the world's largest holding companies, Buffett and his business partner, Vice Chairman Charlie Munger, have often talked about how they made most of their money in a handful of really great businesses. They didn't seek diversification for the sake of diversification even though they always were attempting to diversify their income sources. Rather, they exercised extraordinarily levels of patience, sometimes sitting on large cash reserves in their portfolios for extended periods of time until something intelligent came along for them to buy. Insist upon a margin of safety between the purchase price you are paying for a business and the intrinsic value of what that business would be worth to a long-term private buyer as measured by the net present value of the discounted cash flows. This means avoiding things like value traps or dividend traps. If in doubt, calculate your share of a firm's look-through earnings. Avoid using large amounts of leverage to buy stocks or speculate in the capital markets. If you're smart, you don't need it and if you're dumb it can hurt you. Only buy things you understand. (Legendary investor Peter Lynch put it as, "Invest in what you know".) Dive into the Form 10-K and annual report. "KISS", or "Keep It Simple, Stupid". Look for signs you're dealing with a shareholder-friendly management. Focus on the long-term. Warren Buffett says that you should be perfectly fine if the stock market closed for years after you acquired ownership in a business by purchasing its stock, content to focus on the net income applicable to common and the dividends you receive as an owner even if it meant you couldn't buy or sell anymore during that period. Aside from this, there is something that Warren Buffett also repeats that doesn't get a lot of coverage in the press though it is extraordinarily profound. 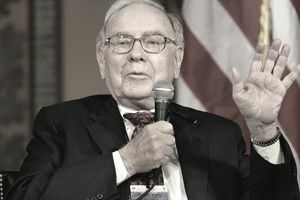 Since at least the 1990s, when visiting college students and giving advice on how to get rich, Buffett has often said, "I could improve your ultimate financial welfare by giving you a ticket with only twenty slots in it so that you had twenty punches - representing all the investments that you got to make in a lifetime. And once you'd punched through the card, you couldn't make any more investments at all. Under those rules, you'd really think carefully about what you did, and you'd be forced to load up on what you'd really thought about. So you'd do so much better." Why? Too often investors throw money around like scattering seed, saying to themselves, "I'll throw a little here and little there to see what happens." Instead, Buffett advocates a policy of finding the best and richest soil, planting a substantial amount of seed in it, and protecting it. This policy may sound simple, and it is. It also can be life-changing. Lou Simpson, one of the best investors in the world and head of GEICO's equity portfolio, once said that this particular Buffett strategy helped him enormously in his record of crushing the market over several decades.